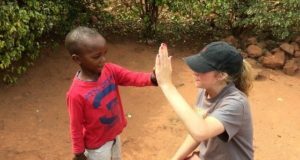 Westminster students Madison Rybak, left, and McKenna Peters traveled together with Humanity for Children to Rwanda and Tanzania in 2016. 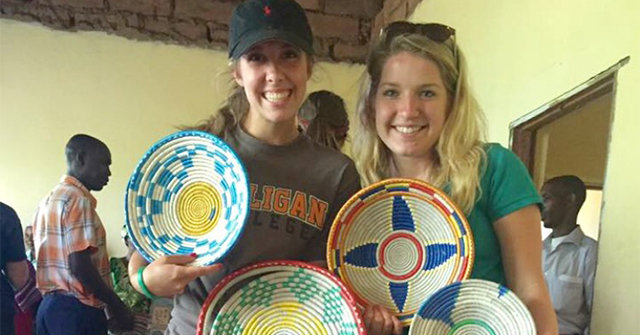 While some students will be at the beach or working typical summer jobs, McKenna Peters ’19 ΚΚΓ and Madison Rybak ’19 ΚΚΓ are journeying to a rural Maasai village in Tanzania, East Africa, to educate women. Peters and Rybak are recent recipients of the 2019 Projects for Peace Grant. A part of the Davis United World Scholars Program, the $10,000 grant allows students such as Peters and Rybak to perform service projects all over the world. 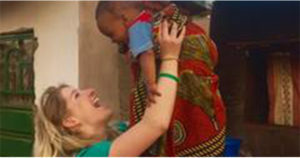 “We are so excited to go,” Peters says, adding that the two previously traveled with a Westminster group to Rwanda and Tanzania in 2016 with the nonprofit organization Humanity for Children. Some of the people they met in 2016 will be waiting for the small group of Westminster students, faculty, and retired faculty who will be participating in the project this summer. 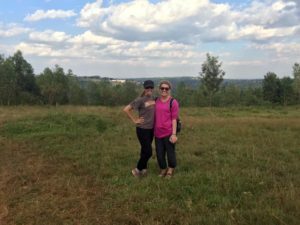 Rybak, left, and Peters are both looking forward to returning to East Africa this summer. Peters and Rybak will head up the project, which will focus on female hygiene management. “There are many cultural taboos surrounding menstruation, and many girls drop out of school due to lack of management abilities, taboos, and embarrassment,” Peters explains. Peters and Rybak will visit secondary schools to help girls implement a peer-education model for puberty education, support, and empowerment. The program, which uses educational materials in both English and Swahili, begins at the end of May and lasts for about two weeks. Campus involvement: In my time at Westminster, I have been both New Member Chair and Vice President-Standard for Kappa Gamma, Vice President of Pre-Healthcare Professionals Association, Philanthropy Chair for Student Ambassadors, and a lab TA. How Westminster is helping her find her purpose: As a freshman, I was not the most goal driven, but the professors helped me to realize my potential and discover a passion for learning that I’d never had before, which motivated me to work harder and strive to achieve more. Without the remarkable professors, I don’t think I would have the work ethic or leadership skills that I have today, and I would likely be on a completely different career path, unknowing of my passion for becoming a health-care provider. Future plans: I am enrolled to begin the Accelerated BSN Program at Goldfarb School of Nursing at Barnes-Jewish College in the fall of 2019. I hope to later pursue a master’s and doctorate in nursing and work as a nurse practitioner in trauma or an ICU. A superpower she wishes she had: Teleportation, because I could be anywhere at any time I wanted, and since I’m typically always running late, that would be very helpful! Campus involvement: I am involved in Pre-Healthcare Professionals Association, Student Foundation, Student Ambassadors, Alpha Chi, and Omicron Delta Kappa. How Westminster is helping her find her purpose: Westminster has helped me find my purpose by providing a second home and a community full of support and education. Through close relationships with professors and friends, I have not only increased my genuine passion for the medical field but found a happy balance in my life and made lifelong friendships. Future plans: I hope to attend medical school at the University of Missouri-Columbia, with an interest in pediatrics. A superpower she wishes she had: I wish I could fly, so I could travel throughout the world and visit all the countries I’ve never been to.